Aozora is the industry leading manufacturer which aims at providing the best water solution to create a healthier and better living life. Backed with market leading filtration technology and manufacturer's 1-year warranty, Aozora makes the go-to brand when it comes to water drinking. Tested and certificated by NSF/ANSI Standards 42 and 53, and FDA Registration. Manufactured with the highest quality BPA free food-grade materials. The pitcher water filter is applied to the market advanced 4 -Stage Filtration System. The Activated Carbon Granules contributes to the most effective media to remove Chlorine taste and odor. Reduction rate is up to 99% and an average is 98.2% under standard laboratory condition. Large 10 cups water capacity with 1 free filter provide up to 40 gallons of crystal clean water- change filter approximately every 3 months. No matter for making coffee, cooking pasta or bread, your Aozora offers better water for taking care of the family. Drinking filtered water helps maintain energy and feel better. We are not looking for the fast but the best. Aimed at providing the healthy and clean water to drink, we control the filtering speed at a certain scientific level for thorough filtration. Finer filtration process greatly removes chlorine taste and odor, mercury and cadmium, often found in tap water. 90 days money-back guarantee and 365 days replacement warranty. For any concerns or inquiries, feel free to find us at support@iaozora.com. Our customer representatives will provide assistance in 12 hours with friendly service. YOU ARE WHAT YOU DRINK - Water is essential to life. The water in your body will be renewed about every 7 weeks, mostly by what you drink. 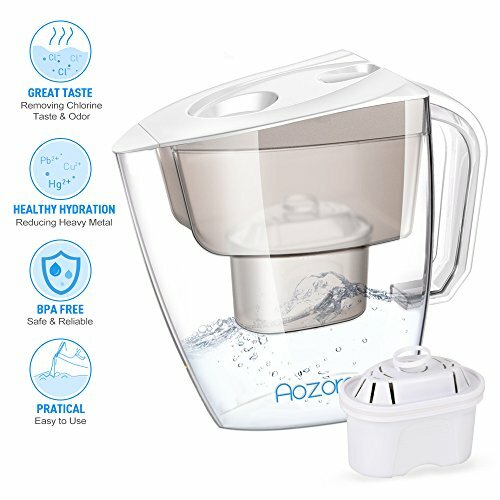 Aozora four-step filtration process is providing great taste and healthy water, and with large capacity and easy-refilling design can keep your family refresh all days. NO HORRIBLE SMELL ANYMORE - With high density and high microporosity Activated Carbon Granules, Aozora filter has a vaster surface area, not only removes harmful contaminants to keep the water safe and clear but also absorbs the Chlorine taste and odor from the tap water. BEING HYDRATED PROPERLY - Get your family back to being properly hydrated once again. Compared to producing reverses osmosis water, Aozora is making healthier water. Aozora Ion Exchange Resin significantly reduces harmful heavy metal ions like Lead, Mercury, Zinc, Copper, Cadmium, Chromium; at the same time, it retains trace minerals for kids growing up. In addition, with high-quality PET fabric, Aozora filter separates all solids to make sure your water is pure and soft. WORRY-FREE DESIGN - Aozora cares about your health and take your health to responsibility. All components of the water pitcher are made with food grade, BPA free plastic which pass FDA registration, that'll also help to prevent an onslaught of health issues related to plastic products. Every part is detachable for thorough cleaning, to prevent the algae from growing easily. YOUR INVESTMENT IS FULLY GUARANTEED - At Aozora, we are confident that our water filter pitchers are manufactured under strict quality standards to give our customers the best experience. That's why we back them all with a 90 days money back guarantee and 12 months replacement warranty. For any problems, please contact us and we will reply to you immediately to solve all of your worries. If you have any questions about this product by Aozora, contact us by completing and submitting the form below. If you are looking for a specif part number, please include it with your message.